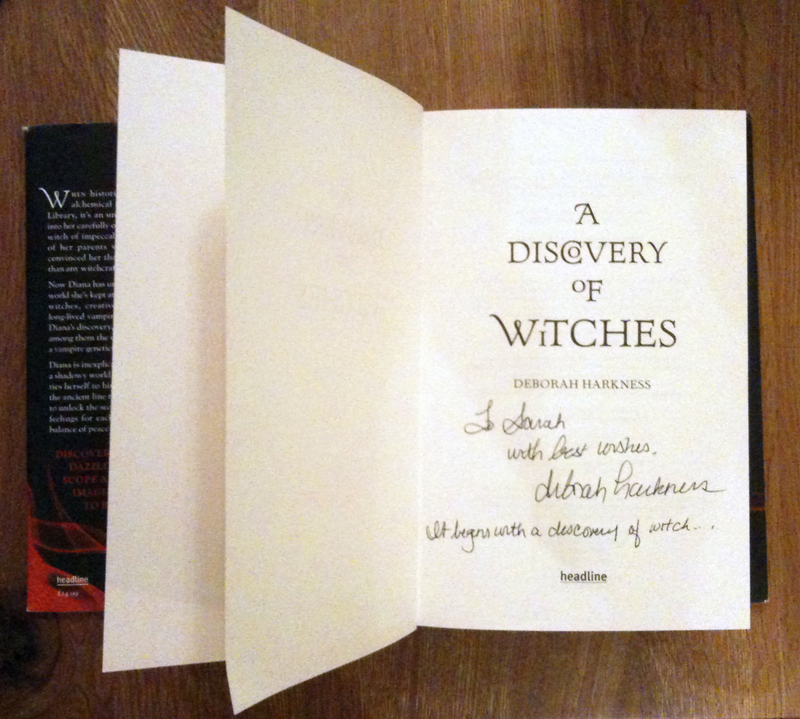 As a follow up to my review on 1st March, yesterday afternoon I attended an ‘A Discovery of Witches’ event hosted by Blackwell’s bookshop, where we got to meet the author, Deborah Harkness, and go on a mini walking tour of Oxford to the key sites that feature in the novel; The Covered Market, The Duke Humphrey’s Library at the Bodleian, All Souls College, The Bridge of Sighs at Hertford College, and New College (as well as Blackwell’s itself, of course). We stated by gathering in the historic Gaffer’s Office at Blackwell’s, which has been kept as it was when Sir Basil Blackwell received many notable guests such as Dorothy L. Sayers and T.S. Eliot. It was here that Deborah gave us an introduction to herself and what led her to write the book, including the details of the lost John Dee manuscript she found at the Bodleian when researching for her thesis! We were then entertained by a couple of readings from the book before setting off on the walking tour where we were regaled with interesting bits of information by both Deborah and the Blackwell’s tour guide. The highlight was clearly the Duke Humphrey’s library with its ancient bookcases and painted ceiling, and as we gathered in the Arts End we all peeked down the central aisle to the distant and sunny Selden End where the story starts for Diana Bishop when she discovers the lost manuscript of Ashmole 782 and first meets the vampire Matthew Clairmont. After the tour it was time to head back to the warmth of the bookshop where Deborah happily signed copies of the book for us, offering to dedicate mine to my cat when I apologised for the rip in the cover that was the work of a feline claw; a feline with a temperament not unlike that of Tabitha, the cat of a witch called Sarah who is one of the characters in the book! It was a very enjoyable event, and wonderful to meet Deborah Harkness, who is a lovely as she seems on twitter, and clearly very fond of this amazing city of Oxford, with all its history and magic.